Outsourcing Payroll with Intuit frees up time so you can focus on growing your business and have peace of mind knowing your payroll is completed accurately and timely. So how do you determine if outsourcing payroll makes sense for your business? Payroll – this is one word most everyone regardless of business type – understands. Or do they? We can all agree that Payroll is a vital role in any company, big or small. To prepare employee paychecks, the employer first calculates the pay for that pay period. Then the employer must withhold FICA taxes (Social Security and Medicare), and Federal and State income taxes from each paycheck. The employer may also deduct other amounts from the paycheck. These might include retirement plan and health plan contributions, union dues, and charitable contributions. But “doing payroll” isn’t complete yet. After the employer distributes paychecks (or uses direct deposit), other calculations must be done. The employer must calculate and set aside amounts deducted from the employee’s pay, to be paid later. The employer must also set aside an amount for the employer’s contribution to FICA taxes and for unemployment taxes. “Doing Payroll” also includes record keeping. A separate record must be kept for each employee, showing amounts paid for each pay period, for end-of-year reports. Records must also be kept of employee authorizations and any changes in pay. If this all sounds complicated, it is! That’s why many employers outsource payroll. Intuit offers a couple of great options for outsourced payroll: Intuit Full Service Payroll (IFSP) when you are using QuickBooks Desktop software, and QuickBooks Online Full Service Payroll (QBOFSP) if you are a QuickBooks Online user. 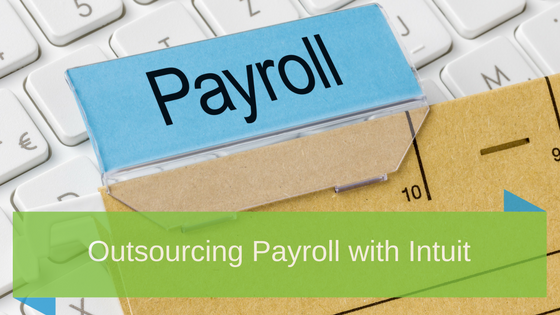 Intuit has made outsourcing payroll a no-brainer; so why wouldn’t you outsource? From getting you set up, to handling your payroll taxes, Intuit makes sure your payroll and employees are taken care of. Total pay and hours are instantly calculated for you—so you can print checks or use free direct deposit. Error detection technology ensures accuracy and gives you and your client peace of mind. So affordable, you can’t afford not to use it.